What if there was a way to tell exactly which part of your marketing strategy is working? Or a formula to follow to keep you from pouring your budget down the drain? Well, there is. And that's exactly what I'm going to show you in this post. We'll discuss creating a system of repeatable processes that generate results consistently. Over time, your wins will multiply to create predictable growth. All of us start by making marketing decisions based off intuition. You do what you feel is going to work. Sometimes you’re right. Other times you’re not. Marketing Measurement allows you to set a baseline to quickly identify (and repeat) what’s working and get rid of what isn’t. 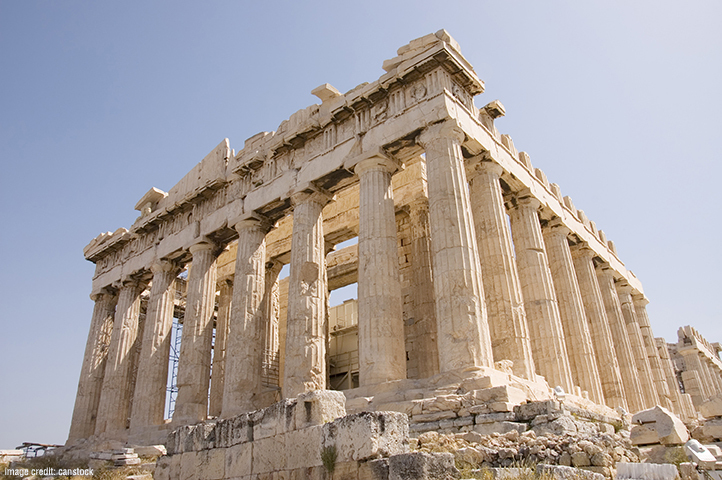 Legendary marketer Jay Abraham calls a successful marketing strategy a Power Parthenon, because each productive element you add is a pillar that creates a structure so strong nothing can bring it down. In a nutshell, that’s the blueprint of a successful marketing plan. Create as many fruitful channels of growth as possible, then focus on them in order of priority. Measurement is the cement that holds the whole system together. With so much access to big data these days, it’s easy to get data crazy. I determine what to measure by answering a series of questions that help me map out critical steps to measure along a customer’s journey. Who is your perfect customer? How many of them exist? How do potential customers find you? How do you find them? Do your customers self-identify by showing interest? What important steps must be completed on a customer’s journey? When does a prospect transition to being a customer? How does a one-time customer become a (repeat) client? Assign a Key Performance Indicator (KPI) to each of those critical intersections and measure them. Distill your progress down to as few numbers as possible. Ratios can often be helpful. Now you know what to measure, so you’re good to go. Right? Not quite. Before you get to the actual measurement you should determine what success looks like. Set specific and numeric goals. If a certain KPI isn’t reaching its goal, either your estimate was off or your marketing is underperforming. If you already have specific numeric goals, great you’re off and running. Don’t have specific goals? Take a minute to brainstorm what your company and life looks like once you’re successful. What measurable milestones do you have to hit to get there? You’ve just become a Real Estate Agent. After brainstorming what success looks like for you, the expenses and investments to create your vision come to 12K/month. How many homes sold will create that much take home income? Let’s estimate 3 sales per month will do it. Here’s a reverse engineering example for finding the stops along your critical path. Each of those stopping points will have an associated measurement. Notice how each step is built on the step before it. How many active clients (looking at homes right now) do you need in your pipeline to average 3 sales each month? How many new leads do you need each month to have 15 active clients? What measurable ad sources will consistently generate a total of 150 leads per month? You’ve now determined that the first step is to generate an average of 150 new leads per month. If you can increase your conversion percentage (by sourcing better leads, or becoming a better salesperson), it will take even fewer leads to reach your goal. List out the marketing options and estimate the number of leads each advertising source can generate. Keep a spreadsheet including the cost of each option, the leads it generated and how many of those leads became active clients. Over time, having measured the steps along your critical path, you’ll begin to sort the winning opportunities from the losers and create a bulletproof plan for hitting your 150 leads each month. Grab a copy of my personal budgeting and measurement template by using the form below. I like to start with simple examples, but know that this goal setting and measurement plan works in any industry and for individuals or teams. By asking people to take an action, you can measure how many complete your request. The call to action request must be something that you can track, like an email list signup, incoming phone call, or form submission. ﻿﻿﻿﻿Every advertisement must ﻿﻿have ﻿﻿a Call To Action.﻿﻿﻿﻿ The results must be measurable like clicks, phone calls, or form submissions. Incentivize completing your call to action by offering something of value for people to redeem or collect. Measure how many people complete your call to action, and you’ll know what’s working and what isn’t. This article is a part of my content marketing strategy. My goal is to share useful content that attracts like minded individuals to become a part of my network. On some level, I write these articles just to get the thoughts out of my brain. But, I do hope that some of my readers will eventually become clients (or collaborators, or mentors, or friends :). My call to action is the content upgrade form on this page where you can, "Get my Marketing Budget Template". I'm measuring the number of people who view this article and how many sign-up for the template. From there, I can measure how many people who received the template eventually become clients or partners, and know how effective my time spent writing was as a part of our overall marketing strategy. Soon, managing your marketing budget will resemble balancing an investment marketing portfolio. Allocate a certain percentage to guaranteed wins, and put the rest into multipliers that are more risky, but if successful will generate explosive growth. After locking in your critical KPIs, begin to optimize smaller steps along the customer's journey. Instead of just form sign-ups you can measure and tweak intermediate steps like how many people viewed the landing page your signup form was on, but didn’t fill it out. Fixing the worst performing KPIs first will yield the greatest gain, especially if they are early on in the customer journey. Marketing methods often work collectively. They say it takes 8-12 touches before a prospect is ready to do business with you. Attribution models make sense of where to assign credit for successful conversions. ​Here, we've focused mainly on single attribution methods. First-Touch attribution is essentially lead generation. Which advertising or marketing piece first came in contact with the prospect? Last-Touch attribution focuses on what method ignites the final sale. If you’re just getting started, stick with single attribution methods before you dive into anything deeper. If you’re already an advanced marketer, check out this amazing article, by Avinash Kaushik, on digital attribution. You made it to the end, so I know you’re serious about measuring your marketing and generating growth. As a gift, I'd like to share my personal marketing budget template. Grab it below. It will show you which elements in your marketing mix are generating growth and which are duds. Is there any area of marketing measurement that you still have questions about? Good information to have and use. Thanks Will, glad the information was helpful to you.